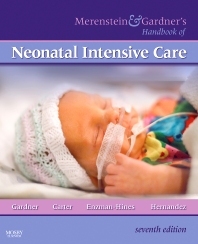 The leading resource for collaborative critical care for newborns, Merenstein & Gardner’s Handbook of Neonatal Intensive Care, 7th Edition provides a multidisciplinary approach and a real-world perspective. It focuses on evidenced-based practice, with clinical directions in color for easy retrieval and review. Special features help you prioritize the steps in initial care, and provide a guide to sharing information with parents. With each chapter written jointly by both physicians and nurses, this book is comprehensive enough to suit the needs of the entire team in your neonatal intensive care unit. Unique! A multidisciplinary perspective is provided by an editorial team of two physicians and two nurses, and each chapter is written and reviewed by a physician and nurse team, so information mirrors the real-world experience in a neonatal intensive care unit. Unique! Clinical content is in color, so you can quickly scan through chapters for information that directly affects patient care. Unique! Parent Teaching boxes highlight the relevant information to be shared with a patient’s caregivers. Critical Findings boxes outline symptoms and diagnostic findings that require immediate attention, helping you prioritize assessment data and steps in initial care. Coverage in clinical chapters includes pathophysiology and etiology, prevention, data collection, treatment, complications, outcomes, prognosis, and parent education.